The Hotel is located in the most prestigious and exclusive area of the city, just between the European and Independence Squares. Situated on the top of Prince Vladimir Mount, directly in the heart of ancient Kiev, Gintama sits in a quiet, cozy corner, surrounded by the greenery of lawns and age-old trees. Gintama hotel has 25 rooms: 15 single rooms, 8 double rooms, and 2 two-room suites. Each room is equipped with air-conditioning, fully stocked mini bar, cable television, Internet access, marble tile bathrooms, and Jacuzzi's in the suites. 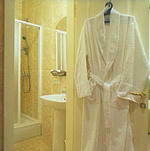 For your relaxation, you may visit hotel´s sauna or massage room. Gintama Hotel is richly decorated with antique furniture and numerous original paintings of world famous artists. In the bar you may stay for a long time, tasting drinks, getting acquaintance or watching TV. 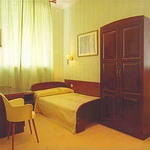 Highly qualified staff will make you feel comfortable in the country and in particular in the Hotel. There are also laundry, cleaning and 35 car parking lot under 24 hour security in the Hotel. Hotel´s restaurant offers a wide selection of Ukrainian, Russian, and European cuisine. A buffet breakfast is included.